In the virtual world of blogs, YouTube and web sites, Sunshine MacKenzie is all that. The current “IT” girl in the foodie industry; Sunny has the looks, the personality and the followers to be on top. She cooks and chats with her viewers from her industrious, cool, NYC kitchen, just got a huge book deal and signed on with the food network. But the online world we create is not always foolproof and suddenly “aintnosunshine” is raining on her very well performed parade. Her adorable husband Danny and so-called friends do not stick around to see the sun rise again and she finds herself back in her hometown of Montauck, NY struggling to put the pieces of her life back together. When the clouds start to thin, Sunny’s real past helps her see the future a lot more clearer. 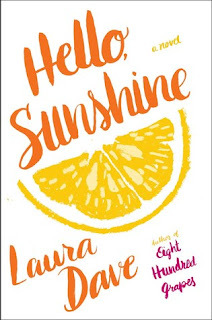 Another adorable read by author Laura Dave (LOVED Eight Hundred Grapes) This very contemporary tale of what happens when the internet lives we create collide with reality -not so far fetched. Light as a feather, fun, fast paced. Highly recommend this ideal summer beach read.